Some boats just look salty, beckoning us to throw off the lines and chase the sunset. 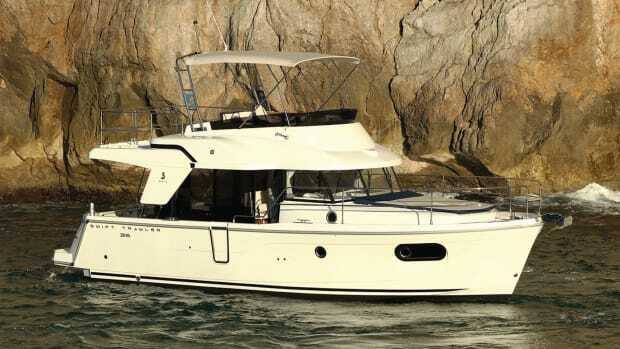 This was my immediate impression with the Beneteau Swift Trawler 47 at last fall’s Ft. Lauderdale boat show. Lamentably, she was snarled in among her siblings, hard by one of the hundreds of temporary quays. Running her in open water would have to wait. It did provide the opportunity to inspect the 47 and compare the vessel to her successful brethren. 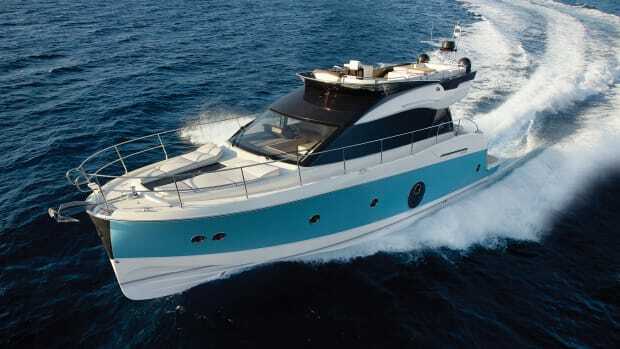 “[Beneteau] has been selling Swift Trawlers for almost 10 years,” Justin Joyner, powerboat sales manager of Beneteau America tells me. “We’ve built over 1,500 of them.” That’s an impressive number for a quartet of vessels. 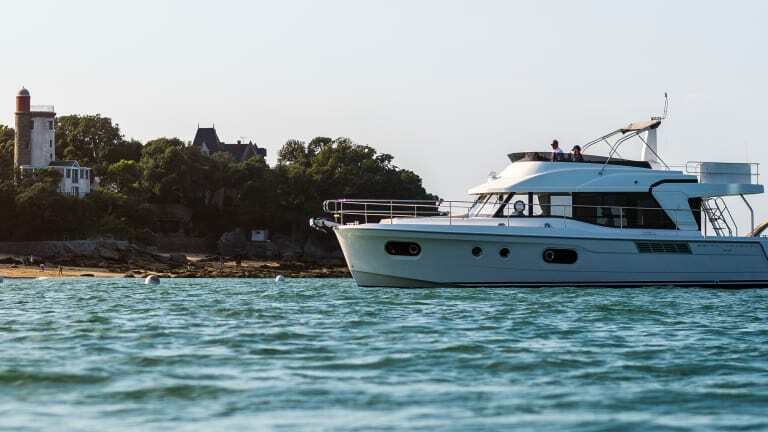 The 47—a tad shorter than the flagship 50-footer—makes it a classic quintet, with the rest of the vessels ranging from 30 to 44 feet. 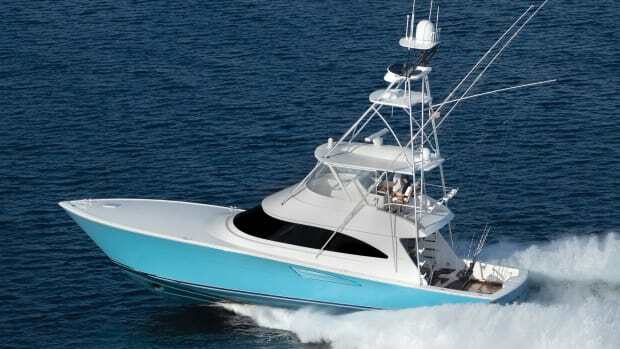 One measure of the line’s popularity is what Joyner calls “Swift Trawler DNA” that starts with a semidisplacement hull. 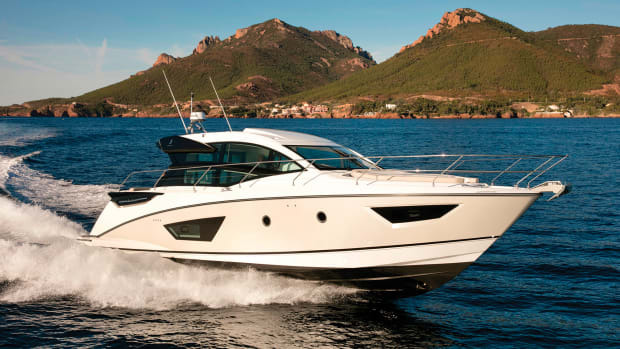 The hybrid performance has been attracting buyers from larger, faster and thirstier express cruisers and flybridge boats, according to Joyner. 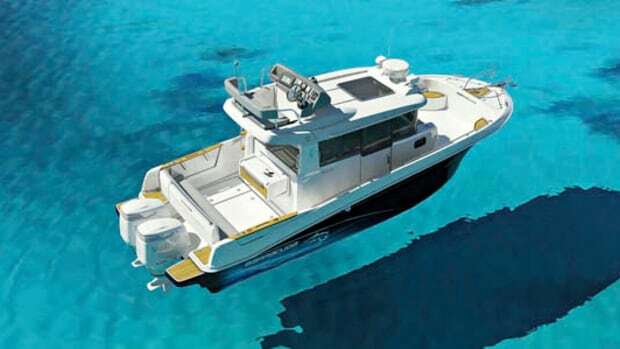 Matched to twin 425-hp Cummins diesels, the hullform allows the 47 to run efficiently at 10 knots and reap the benefits of a trawler’s fuel economy or cruise at 20 where she’ll still see better than 1 mpg. She’ll top out at 25 knots when you need to outrun ominous thunder-heads or just for the hell of it. 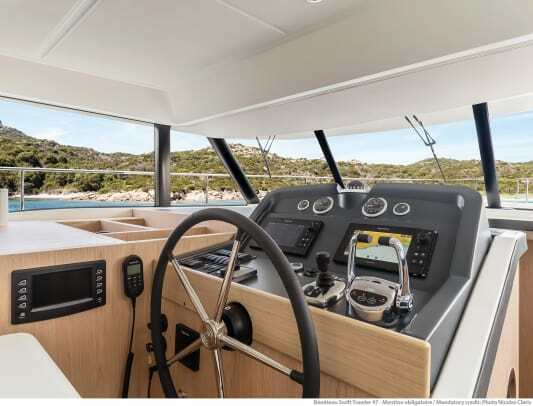 Like the other Swift Trawlers, safety is paramount in the 47’s design. Full walkaround decks with substantial bulwarks are further protected from the elements by the flybridge overhang. There are beefy grabrails in all the right places and a high bowrail on her foredeck. 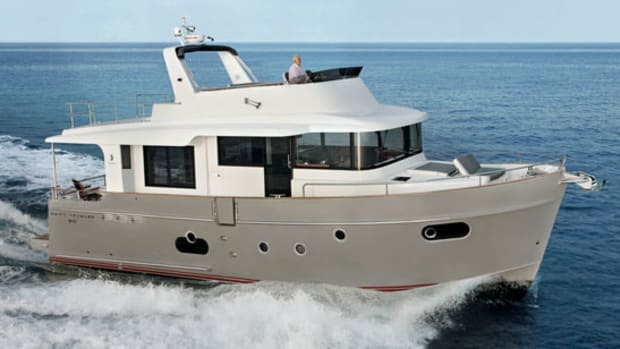 Most notable and common to the series is the 47’s asymmetrical layout: The starboard side deck is much wider and is easily accessed from the aft deck or the salon via a sliding door next to the lower helm. 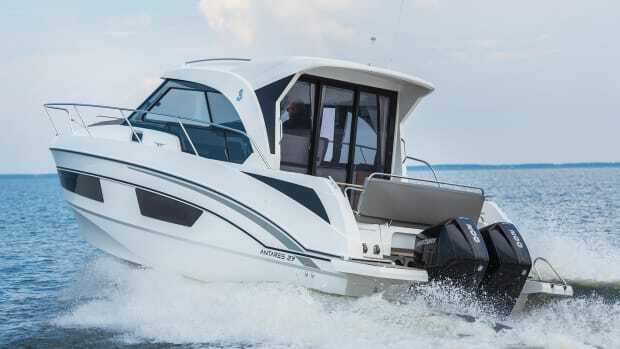 It’s these features that will make the 47 easier to run for a cruising couple, even more so with the optional Cummins Inboard Joystick system. The salon has that decidedly French je ne sais quoi quality, a clean, contemporary look that is both distinctive and attractive yet functional. Large windows on three sides and an aft pocket door keep things bright and airy, with the brushed oak a nice counterpoint to the matte black helm. I particularly liked the L-shaped amidships galley—there’s plenty of stowage for a week’s worth of cruising for six guests split between the three belowdecks staterooms, and the helm chair flips forward 90 degrees for even more counter space. 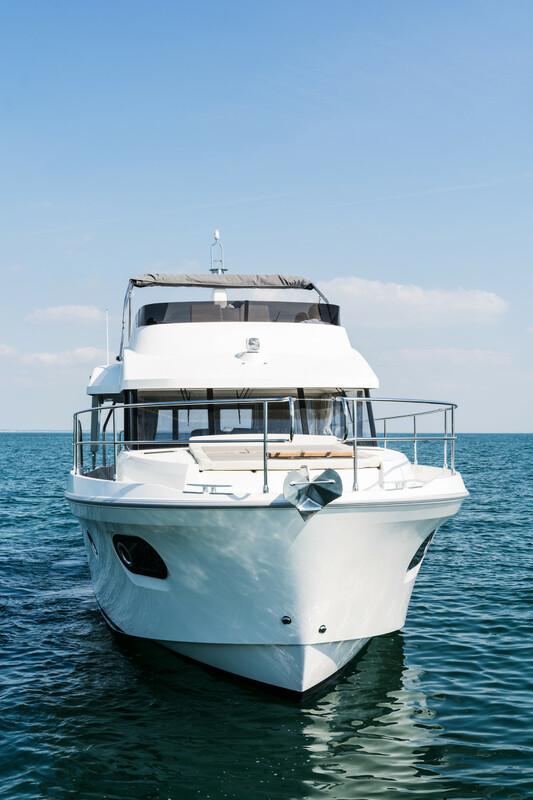 I’d probably do a good deal of my grilling and food prep under blue skies on the flybridge’s galley, its just-enough features ready to cater to eight guests that can be seated comfortably here. 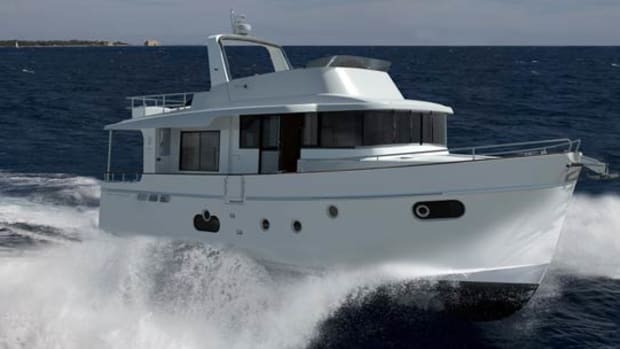 The center-line helm, a first for the Swift Trawler series, has excellent 280-degree sightlines—the bridge’s aft overhang partially blocking views in back. The lower helm may be a better choice—or add the optional aft-facing camera—for close-quarters maneuvering. Joyner also tells me nearly all Swift Trawler sales are to veteran boaters. “These aren’t first-time buyers. They’ve owned a number of boats.” That speaks volumes about the practicality and value of the model line. 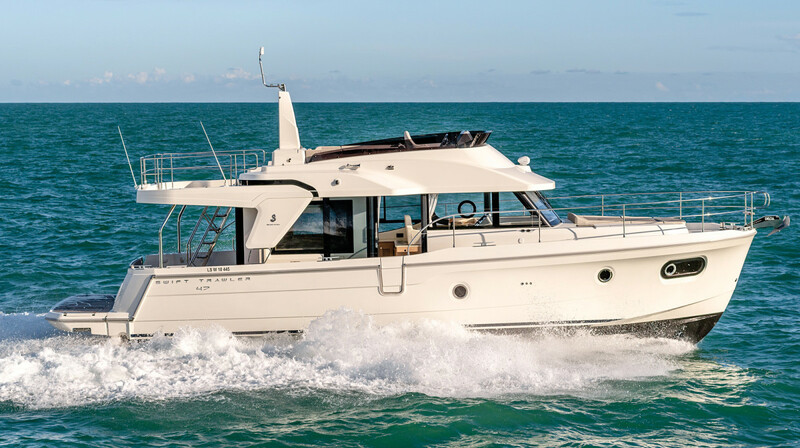 With a full Raymarine electronics package and optioned with a flybridge hardtop (a bimini is standard) and a hydraulic swim platform with built-in tender brackets, the 47 comes in at $988,000. Sophisticated and safe, all signs point to the 47 to continue the success of the Swift Trawler bloodline.